First up, it’s important to know the type of carpet you have or are going to buy. 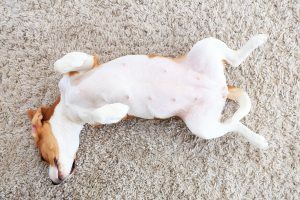 According to Carpetright, any type of loop pile carpet may cause issues with dogs and cats as they are prone to getting their claws caught in the loops. These are still possible to have for your home, but you’ll have to keep on top of nail maintenance for your pet. When it comes to stains, choosing a carpet fibre such a Polypropylene which has natural stain resistance can also help. After all, even the best trained dog or cat can have the odd accident, so it’s great to know how to tackle such an incident. First up, blot the stain. We’re aiming to dry out the affected area as much as possible by removing the liquid, rather than it being allowed to soak in. Keep putting kitchen towel on the stain and weigh down, changing repeatedly. ← Summer Nearly Over But Allergies Remain? Maybe It’s Your Carpet?